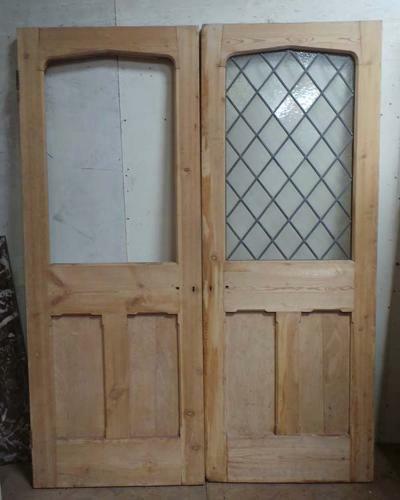 This lovely pair of Victorian pine doors, are fully morticed and tenoned. Each door is fitted with one large arched-top panel for glazing, over two solid panels with decorative gothic chamfer details to both faces. Please note: Individual doors are 29.65 inches (752mm) approximate width each. These measurements are taken without the rebate. All other measurements are taken as a pair. The doors are in excellent condition, fully stripped and ready to hang. The doors are partially glazed with leaded glass, but this will need to be replaced to meet with current safety regulations. Please contact us to discuss glazing options.